Villa Rintetorp we have lovingly renovated ground-more than two years: a new roof, 3-glazed windows, new wooden ceilings, doors, floors and brand new equipment. The water from the deep wells has drinking quality. The kitchen is top standard with fridge / freezer, touch screen hob, oven, dishwasher etc. The dining table in the kitchen is designed for 6 people. The furniture is high quality, comfortable and also offers 6 people; An LED TV can be tilted as desired in the room. About Astra satellite German television is inevitable. We can put an extra 4 km fiber optic cable for this house, so you do not have to do without Internet (Wi-Fi) and the streaming movies. The limitless use of the fast traffic is here in the wilderness an unusual luxury. The interior of Villa Rintetorp is held entirely in bright, Scandinavian style. The floor bedroom has its own access to a small bathroom with shower. The Swedish "all-go-style" bathroom is also accessible from the dining area. The second bathroom with extra wide and durchgefliester shower, massage bath, light therapy and sauna is located on the first floor. In the hallway area of ​​the first floor we have set up a seating area under the roof windows - was space there yes. The second bedroom upstairs is large, bright and has its own closet. With its comfortable seating under the deep-drawn skylights, it lends itself well as a residential bedroom. The third bedroom has failed less because of our superior bathroom Wishes and suitable with its loft bed for children. The basement is very friendly and bright - even here wooden ceilings and recessed spotlights. Apart from the domestic technology with pressure boilers and hot water heaters here is the washer-dryer combination and a large utility room with plenty of closet space for vacuum cleaners, lifejackets, washing utensils, Vacation Gerödel and much more. The special thing about Rintetorp is actually its location. 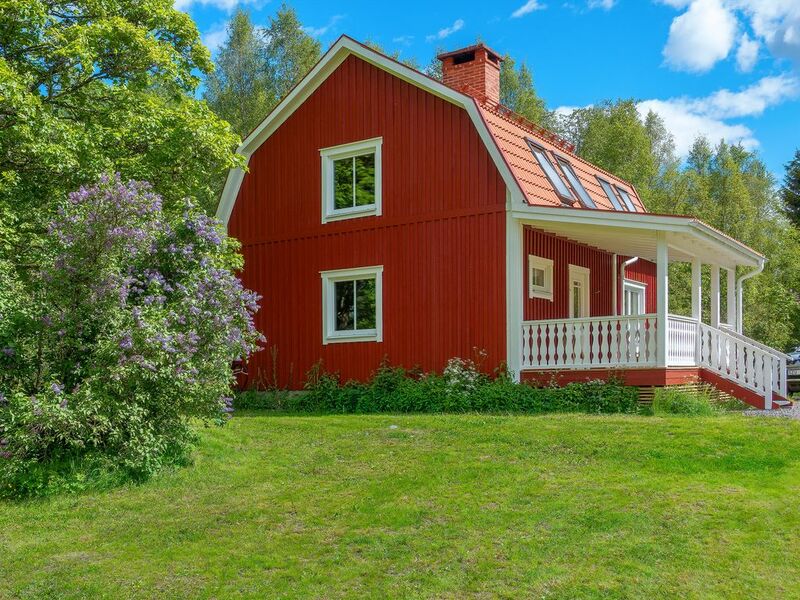 You will find a top-renovated holiday home with whirlpool and high-speed Internet in the middle of the wilderness in Värmland. Here the moose march on the property right in front of your terrace - assuming you are a little bit sensitive and do not like to sound the whole day with hard rock. Nearby, a golden eagle couple also breeds. The lakes in the area (and there are some, apart from fast flowing streams) will probably be all to yourself. The hiking tours directly from the house are infinite in their possibilities and the wildlife observations should adjust themselves with discreet own behavior (tip: early in the morning). The famous Sieben-Höfe-Weg is close by - you can reach it from the back, as it were, over very lonely paths. The "Värdshus am Tvällen" (which is known for its quality in further editions) is really close to you (5 km). Here you can dine divinely and be served one or the other red wine. Incidentally, we live only a few kilometers away from you and appreciate the secluded location in great natural surroundings. Both bathrooms are tiled in the shower with Bodenabläufen (so no slippery pitfalls). Clear instructions were left on how to use everything which was wonderful! Unser Urlaub in der Villa Rintetorp war wunderschön! Wir haben zwei tolle Wochen über Weihnachten und Sylvester dort verbracht. Frau Peters hat uns sogar mit Weihnachtsbaum, Lichterkette und Baumschmuck versorgt. Im Haus ist wirklich alles vorhanden was man braucht. Für noch mehr authentisches Abenteuer sorgten 14 Stunden Stromausfall 😄 Für den ein Sturm verantwortlich war. Aber auch hier stand Frau Peters mit Rat und Tat zur Seite, ohne dabei irgendwann aufdringlich zu wirken. Für Ruhesuchende die alleine die Zeit verbringen möchten ist es perfekt. Der Urlaub in der Villa Rintetorp wird uns noch lange in Erinnerung bleiben! Man braucht wirklich nicht nach Lappland, wenn es richtig einsam sein soll. Mitten im Wald und nicht weit entfernt jede Menge ebenso einsame traumhafte Seen. Abends dann in die Sauna oder in den Whirlpool und anschliessend ein Glas Wein vor dem bennenden Kaminfeuer. Ein wirklich toller Urlaub, danke dafür. Ein wirklich wunderschön gelegenes und ausgezeichnet ausgestattetes Ferienhaus. Kein Verkehr, keine Nachbarn, aber dennoch dank Glasfaserkabel Anschluss an die übrige Welt. Wir würden gerne wiederkommen. Wir haben uns in diesem ruhig gelegenen und sehr naturnahen Haus absolut wohl gefühlt. Für die Kinder ein absolutes Naturparadies mit großem Grundstück und angeschlossenen Wäldern. Herrlich zum Spielen, Spazieren und Abenteuern. Das Haus ist auch schön eingerichtet. Sehr gern wieder! Meine Frau und ich hatten einen wunderschönen Urlaub in diesem perfekt eingerichteten Haus. Die Umgebung ist ebenfalls absolut perfekt. Vielen Dank an den Vermieter ! Villa Rintetorp enjoys an exclusive single-location in Värmland forest and lake landscape on a sunny plot of 10 000 m² size. The well-kept lawn in front of the house occupies a large part of this area and is surrounded by deciduous trees. The location is a perfect place highly-idyllic and for nature lovers, Solitude seekers, hikers and mountain bikers. In fact, here wolves, lynxes, bears and moose still live undisturbed. - A secluded location as in Rintetorp must oneself looking high up in Lapland with a magnifying glass. The nearest neighbor lives 3.5 km away; the nearest shop is 20 km away. Villa Rintetorp is not right on a lake - then you would have neighbors. But a large number of lakes located in the vicinity (the nearest 1.5 km). The lakes will probably have for themselves - for swimming, fishing, boating. The last four kilometers of the Access Road just gravel, or mounted and suitable for normal, but not deep-down cars. In winter, you should be equipped with snow chains or arrive better with a four-wheel-driven vehicle. Not only the location is exclusive, but also the house as a "Pippi Longstocking movie". - Massage bath, sauna, high-speed Internet via fiber optic cables - we tried with Villa Rintetorp, comfort, Swedish style and the solitary nature harmoniously together. Bitte hinterlassen Sie das Haus in einem ordentlichen und gründlich gereinigten Zustand. Ein Endreinigung kann auf Wunsch gebucht werden. Entstandene Schäden sind zu ersetzen.